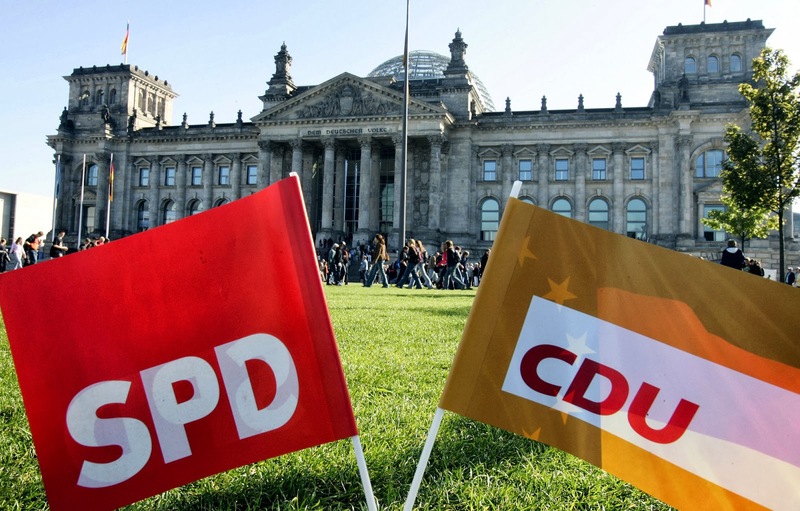 We have seen a first draft of the German coalition government agreement (the final agreement is expected tomorrow), courtesy of Green politician Malte Spitz who published the draft on his blog late yesterday evening. The German media has begun delving into the document while the English speaking press continues to lag behind. The agreement stresses that German must become an official working language of the EU alongside French and English – not entirely surprising given that it was a CDU/CSU electoral pledge, but it highlights that Germany is slowly becoming more comfortable with its role in Europe. There is also a strong emphasis on “subsidiarity” and that the EU must only act where action on other levels is not sufficient. It also highlights that Germany is keen to deepen ties with Poland and maintain the “unique” Franco-German partnership. This may not mean much, but it definitely isn't a nod to David Cameron. In terms of democratic legitimacy, the agreement calls for a "strong role" for the European Parliament and "close involvement" of national parliaments in the decision making process. It also calls for a standard minimum threshold for the allocation of seats under European elections and a "single European suffrage" to add to stable majorities at the European Parliament. The final point here is the call for a "stringent and efficient" set of Commissioners - possibly a hint towards reducing the number of Commissioners and focusing them on policy areas rather than allowing one for each member. The agreement contains few details on the new government’s approach to the banking union and specifically the resolution funds – given that this is known to be a part of the negotiations it is surprising nothing has been included, maybe a sign that an agreement has been hard to come by. The document also contains a rare admission from Germany that the causes of the crisis are "varied" and extend well beyond fiscal profligacy. Specifically to "competitiveness", "imbalances" and "design defects" in the EMU which led to problems in the financial markets. The new coalition will not rule out further bailouts and will consider them but “only as a last resort” when the “stability of the eurozone as a whole is at risk”. Importantly, the agreement reiterates that any use of the ESM, the eurozone bailout fund, needs “approval of the Bundestag”. Remember, this is only a draft. Nonetheless, the agreement looks to be very much as expected – no change of course on the eurozone, some mention of limiting EU power but a continued commitment to the EU and Europe. The draft however, remains vague on some key details. With important negotiations coming up on the eurozone banking union as well as in terms of the future of the EU, the new German government will have to flesh out its position significantly. For German politicians an EU reform is not in any way top of their agenda or a priority. They have furthermore a lot of problems at home now likely papered over by basically overspending as it seems. That won't work for long. Difficult to see another scenario developing for Dave. Therefor he likely has to put it on the German agenda himself. -By making an UK exit a real thing and withing this (German) period. Not occasional but in a way that it becomes something the German politicians react 'instinctively' upon, not something they 'know'. -By AfD or something similar becoming a real political power in Germany. Not necessarily a government candidate, pressure on existing government candidates is likely sufficient. Not Cameron's call. A good EP result might do the job or a new general election. -Via eg the Dutch, Finns or Austrians. Where Eurosceptism is may be not bigger but has entered parliament. -Via markets, preferably when the Euro crisis starts to play again and the markets have gone cold turkey. Likely they will react the most on a possible UK exit. Here as everywhere else I find a substantial majority of opinion against remaining in the EU on any terms, let alone any minimally changed terms likely to be agreed. I cannot remember when anyone not having a vested interest in the EU didn't respond by saying that they want out, not infrequently in even more vehement terms than I use. To what extent if any is Open Europe prepared to review its "Stay in on better terms" policy in the light of such consistent opposition here and elsewhere? One other point - when I ran my electronics company for 30 years I soon realised that the only way to deal with crooks, liars and cheats was to walk away immediately, not try to profit from such involvement. Would anyone here join the Mafia in search of some benefit or other? Then why be involved with an EU that is often and in many ways worse - though, it must be said, is rather less competent than Mafia bosses? It would appear that the germans are doing what they have always done and that is act in Germany,s best interests first, if only our politicians acted that way we would be so much better off. I think that with their obsession with austerity, the Germans are risking breaking up the euro area and even the EU. For example, I read the other day that the Spanish Government is $18bn behind on paying bills, it is seeking to delay payment on military helicopters, and it has been warned by CERN that if it falls any further behind on its contributions to the CERN budget, then Spanish companies would no longer qualify for CERN contracts. I don't think that this kind of thing can go on for ever. Yes, the UK should leave the EU. And good riddance! The EU will be better off without this foot dragging slacker from the EU norms of a social economy. Let the UK go it alone, or try to leverage its "special relationship" (hah!) with the US. A cold slap in the face awaits the Brits, when they find out how much they really count in this world of 7 billion people.